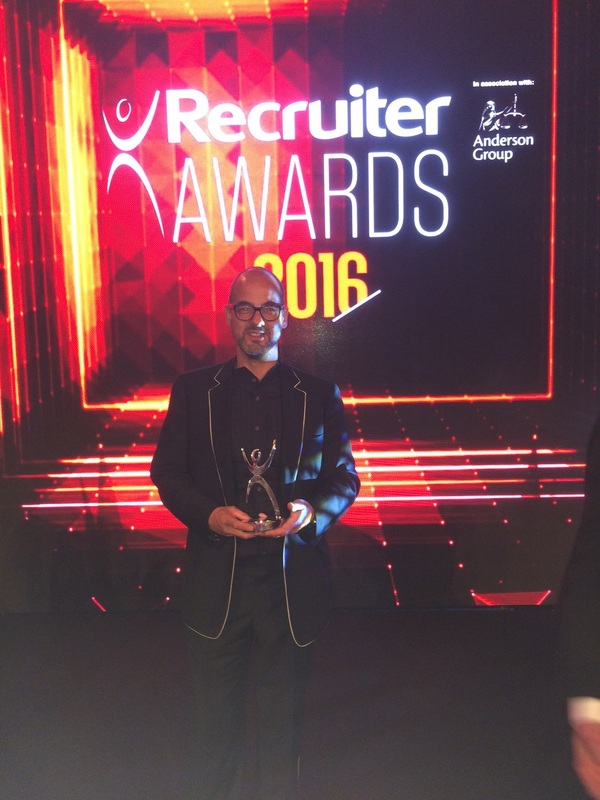 Tony Goodwin, Founder & CEO of Antal International, has just won the Award of “Entrepreneur of the Year” in the Recruiter Awards 2016 ceremony. Tony was shortlisted for the second time in a row and this year, his significant impact on the recruitment industry in terms of creativity, profitability and potential sustainability was recognised with this award. The list of nominees was released in March and Tony Goodwin was competing with well-known professionals from the industry. Business practices, professionalism and ethics of the highest standard were the main values to take the decision. The Recruiter Awards are known and considered to be the largest and most prestigious event in the recruitment community and it was held on the evening of the 4th May at the Grosvenor House Hotel in London, the epicentre of global recruitment with more recruitment businesses than New York, Tokyo, Frankfurt and Shanghai combined. Winning this award facing this kind of competition stands out as even more exemplary given these facts. Antal International, founded in 1993, is a global management and professional recruitment specialist that offers more than just a local recruitment solution, due to the impressive range of sector-experienced industry leaders and traditional recruiters in more than 130 offices in 32 different countries around the globe. Antal is one of the world’s largest and most successful privately owned international recruitment companies and is globally recognised. Antal also offers to entrepreneurs or professional management who desire self-employment the opportunity to own, build and develop their own recruitment business as an Antal franchise, leveraging their backgrounds and Antal’s brand, technology, global platform and proven training. Tony himself believes that the Antal culture stands for ‘doing things rather than just talking about them’ and acted on this philosophy in in starting up Antal in Hungary, Russia, Poland and China, where in all cases Antal has moved to the number one leadership position over its first 20 years of existence. This ‘can do’ spirit has now propelled Antal into India where with almost 50 offices and growing quickly, Antal is now the market leader. Today, Antal is opening offices at the rate of over 2 per month somewhere in the world. Its next objective in terms of both expansion and having global commerce lead is in Iran now that it is opening up. It won’t be long before Antal is trading there and in Cuba. Doug Bugie, President of the franchisee division, Antal International Network says, ‘I’ve known Tony for over 20 years. His drive and ambition have never wavered. If anything they have increased. It permeates the group and we feel that no obstacle is too great to overcome. I see it with the franchise Owners and our support Teams around the world every day. I believe it too. Tony and I both agree, it is not just the ‘CAN DO which makes for great organizations, it is the WILL DO that propels them to the top’.